1. Camera, cell phone & charger, pocket flash light, eyeglasses, sunglasses. The boat has 120vac power for charging and a 12vdc car outlet. 2. Ipod with your music. We have an Ipod connection to the main stereo system. 3. Casual clothes, rain clothes and rain jacket; cap/hat, gloves, warm clothes, swimsuit for hot springs, mud boots or shoes for shore walks; 2nd & 3rd pair of comfortable shoes. 4. Toiletries and meds if any. Airline Bookings: Where possible, book departures early in the day to insure connections. Some of the smaller airports have only one flight in and out per day. This may require you to spend a night in a hotel at regional airport (i.e. Vancouver, Ketchikan, Juneau), then getting the morning flight to the final destination. Fishing: You will be able to purchase 7 or 14 day fishing licenses as needed online from the boat during your cruise. We have salmon and bottom fish poles, shrimp and crab traps. Kayaking: We currently plan to rent kayaks in Ketchikan for the Alaska routes. Our buddy boat Seagate will have two kayaks, which can be chartered for the proper beverage. Cell Phones: Cell phone coverage will be spotty at best. It can also be expensive. You may wish to check with your provider for a short-term Alaska-Canadian plan. Internet: We do have Internet access aboard so you can check your email from our laptop. 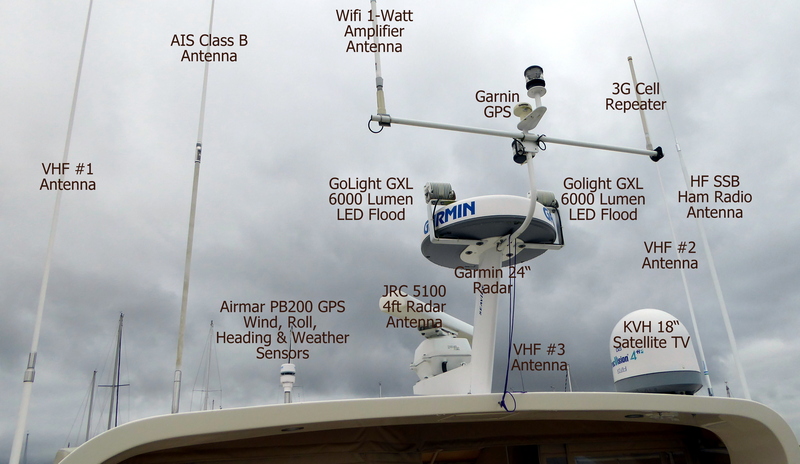 Some marinas have wireless if you want to bring your PDA or small laptop. Ship Communications: We have VHF and HF SSB radio for ship-to-shore communications. Seagate, our buddy boat that will be cursing with us, has a satellite phone available for an emergency. TV: We have Satellite TV so we will know what's happening in the rest of the world. Bring a favorite DVD or two if you like. Provisioning: In most cases, we will be able to purchase groceries and beverages where you pick up the boat. If you have a "special beverage" you may wish to bring it along. Heads (AKA bathrooms): Use only the biodegradable toilet paper provided. Only marine T/P and body waste allowed to be flushed. Please place facial tissues, nail clippings, feminine products, etc. in the wastebasket. Stateroom Ports (AKA bedroom windows): Always remember to close and secure the ports in your stateroom each morning before we get underway. Water usage: Please do not take lengthy showers. Water lasts 3 days for a six-person crew. We do have a small electric hair dryer that is compatible with the ship's electrical system. We will be cruising with a least one "buddy boat" during the entire cruise. A second buddy boat joins us on Jul 19th in Queen Charlotte City. Anacortes to Juneau and return. 3. Misty Fiords, Meyers Chuck, Wrangell - 8 days: Sat, May 31 Ketchikan to Sat, June 7 Wrangell. Fly into Ketchikan via www.alaskaair.com. Fly out of Wrangell via www.alaskaair.com. W/B Crew: Sid & Virginia Findley. 6. Keku Strait, El Capitan Passage, Craig - 9 days: Sat, June 21 Hoonah Harbor to Sun, June 29 Ketchikan. Fly into Hoonah Harbor via www.alaskaair.com and www.wingsofalaska.com. Fly out of Ketchikan via www.alaskaair.com. W/B Crew: Chuck & Caroline French, Vince & Maryanne Fonte. 7. Queen Charlotte Islands - 13 days: Sun, July 6 Ketchikan to Fri, July 18 Queen Charlotte City. Fly into Ketchikan via www.alaskaair.com. Fly out of Queen Charlotte City via www.aircanada.com from Sandspit Airport, Moresby Island to Vancouver. W/B Crew: Jan, Jerry and Justin Watkins. 8. 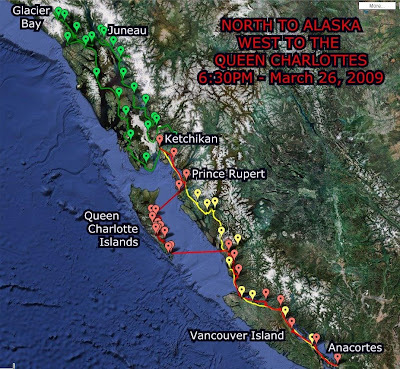 Queen Charlette Islands to Northern British Columbia - 9 days: Fri, July 18 Queen Charlotte Islands to Sat, July 26 Bella Bella. Fly into Queen Charlotte City via www.aircanada.com from Vancouver to Sandspit Airport, Moresby Island. Fly out of Bella Bella via www.pacific-coastal.com to Vancouver. 9. Southern British Columbia Southbound, Rivers Inlet - 10 days: Sat, July 26 Bella Bella to Tue, August 5 Anacortes. Fly in to Vancouver then www.pacific-coastal.com airlines to Bella Bella. Fly out via shuttle to SEATAC then domestic airline. Anacortes to Nanaimo via Poets Cove Canadian Customs - 71 nm: Leave Anacortes at 6AM to allow customs clearing time, current push up Tricomali Channel, and slack tide (1:30PM) at Dodd Narrows. Slip. Nanaimo to Campbell River - 75 nm: Complete provisioning here. Leave Nanaimo at 8:30AM to arrive at Campbell River at low adverse current. Watch for cruise ships in the evening. Slip. Campbell River to Alert Bay - 87 nm: Slip. Depart Campbell River no later than 5AM, about 30 minutes before first light. Transit Seymour Narrows at 5:40AM with 6 knot current push. Use current push up Johnston Strait until 10AM. Visit the native peoples museum and one of the world's tallest totem poles. Great pubs. Fill water tanks. Spare Weather Day: If necessary, wait here for clear weather window for crossing Queen Charlotte Strait and rounding Cape Caution. Crossing Rules are: Listen to 4AM weather broadcast for West Sea Otter Buoy. If seas less than 1 meter and wind less than 20 knots, then GO at 5:30AM! Note 3-knot ebb (push) until 9:30AM slack. Alert Bay to Fury Cove - 70 nm: Anchor. OK to visit Bradley Lagoon at high tide. Fury Cove to Codville Lagoon - 38 nm: Anchor. May wish to continue on to Ocean Falls. There is great wildlife viewing inside this very quiet lagoon. Codville Lagoon to Ocean Falls - 21 nm: Slip. OK to skip this destination if behind schedule. Fill water tanks and fuel up here. Visit this modern ghost town and hike the trails around Martin Lake. Check out Saggo Saloon. Ocean Falls to Bella Bella - 24 nm: Slip. Leave 7AM to make Bella Bella dock by 10AM and airport by 12PM. Use public docks and we will most likely need to side tie. Fill water tanks, provision, and fuel up here. Use shuttle between town and airport. Crew exchange here via www.Pacific-Coastal.com at Bella Bella airport. Bella Bella to Klemtu (Bottleneck Inlet) - 36(46) nm: Slip. Alternate crew exchange airport. Fuel stop if needed. This is a wake-impacted dock. The best anchorage in the area is Bottleneck Inlet, 10 nm NE. Also there is Mary Cove 3 nm E of Cone Island NW end. Klemtu (Bottleneck Inlet) to Bishop Bay Hot Springs - 60(53) nm: Anchor. Depart at 9AM for near slack at Hiekish Narrows. Bring your swimsuit to bath in an unending stream of hot water that is tasteless, odorless and colorless. Bishop Bay Hot Springs to Klewnuggit Inlet - 55 nm: Anchor. Depart 5:00AM to avoid 3-knot adverse current in Grenville Channel. Klewnuggit Inlet contains one of BC's newest Marine Parks. Klewnuggit Inlet to Lawson Harbor - 33 nm. Anchor. Depart at 6:00AM to enjoy a 1-knot push. Lawson Harbor is only 20 nm from Prince Rupert in case we wish to continue. Just around the corner is Kelp Passage Cove another good anchorage. Lawson Harbor to Prince Rupert - 19 nm: Slip. Monitor PR Traffic on VHF 71. There is a 5-knot limit when nearing Prince Rupert. Slip at Prince Rupert Yacht and Rowing Club via Channel 73. Provision and fill tanks here as necessary. Visit the Museum of NBC and see the Kaza Maru. Smiles seafood café is good. Prince Rupert to Brundige Inlet - 36 nm: Anchor. Leave north from Prince Rupert via Venn Passage. Brundige Inlet to Ketchikan - 55 nm: Slip. Depart at 6:30AM to make high tide in Ham Island pass. Clear US Customs. Leave boats in Ketchikan Marina for two weeks. Fly home via www.alaskaair.com or take the Inside passage ferry to Bellingham. Ketchikan, Alaska: Fly in on Saturday. Provision boats; top off fuel; meet next crew. Ketchikan to Shoalwater Pass - 39 nm: Anchor. Enter famous Misty Fiords National Park. Shoalwater Pass to Yes Bay via Misty Fiords - 80 nm: Anchor. Visit Punchbowl and Walker Cove in Misty Fiords. A long but beautiful sightseeing tour, ending up anchored in bulletproof Yes Bay near a fishing lodge. Yes Bay to Meyers Chuck - 48 nm: Anchorage or float side-tie. Inside of float OK. Water on float may not be potable. Locally made crafts are great gifts. Meyers Chuck to Santa Anna Inlet - 24 nm: Anchor. Fishing and prawning. Santa Anna Inlet to Wrangell - 35 nm: Slip. Fill water tanks, provision, and fuel up here. This is a great Alaskan frontier town. Check out the Nolan Museum. Take a tour boat to the Anan Bear Observation platform. Spare Weather Day. Crew exchange here via www.aslaskaair.com Wrangell airport. Wrangell to Petersburg - 40 nm: Slip. Depart at 10:30AM-June 8 (9:30AM-June 7) to arrive at Wrangell Narrows at slack. Clean and neatly laid out Petersburg is famous for its Norwegian heritage. This is the halibut capital of Alaska. Peterburg to Fanshaw - 38 nm: Anchor. Visit the abandoned fox farm at Fanshaw. Fanshaw to Tracy Arm Cove - 37 nm: Anchor. This is the best cove in Holkham Bay. Ice chunks may enter cove on south breeze. Anchor in shallow water 4 fathoms so ice chunks will hit bottom before boat. Tracy Arm Cove, Glacier Cruise to Tracy Arm Cove - 50 nm: Anchor. This is a day of cruising around the Tracy Arm glaciers. We will dodge bergs and enjoy 15 over 15,000 (15 year old scotch over 15,000 year old ice). Tracy Arm Cove, Glacier Cruise to Taku Harbor - 24 nm: Anchor. Taku Harbor to Juneau - 20 nm: Slip. Visit town and waterfront of Juneau. Provision as necessary. Juneau to Auke Bay - 31 nm: Slip. There is a good snack bar and liquor store. Spare weather day. Crew exchange here via www.alaskair.com to Juneau and onward. Call Glacier Bay National Park 907-697-2627 after 10:00AM to confirm existing reservation, or to obtain a reservation to enter. If no GB reservation, combine all crews to one boat for Glacier tour, if necessary to get reservation. Auke Bay to Swanson Harbor - 30 nm: Anchor or use float. This anchorage is a great crabbing spot. If not called yesterday, call Glacier Bay National Park 907-697-2627 to confirm existing reservation. Swanson Harbor to Bartlett Cove, North Sandy Cove, Glacier Bay - 37 (+21) nm: Anchor. Note 1200 hours 5-knot push current at Glacier Bay entrance. Call National Park Service Glacier Bay on VHF 16 before entry. All crew goes thru GB orientation. Continue on to North Sandy Cove anchorage. North Sandy Cove, deep Glacier Bay, Blue Moose Cove - 66 nm: Anchor. Spare Day in Glacier Bay. Glacier Bay (Blue Moose Cove) to Hoonah Harbor - 56 nm: Slip. Note -1020 hours slack tide at Glacier Bay entrance: be out before 1000 hours with maximum push of 6 knots at 0730 hours. Water up, provision and fuel up if needed in Hoonah. Visit the Tlingit Cultural Center. Hoonah Harbor to Warm Springs Bay - 79 nm: Anchor. Crew exchange here via www.wingsofalaska.com or www.ferryalaska.com to Juneau and www.alaskaair.com onward. Leave by 3PM for current push and to make Warm Springs Bay at 11PM. Spare Day for Sitka floatplane trip via Harris Aircraft Services (907) 966-3050. For those that want to hang out in the Warm Springs hot tubs, that's OK too. Or we can push on! Warm Springs Cove to Baidarka Anchorage in Keku Strait - 53 nm: Anchor. Enter 36 nm Keku Strait at 1430 hours (+5 ft) to arrive at Summit (24 nm) at 1800 hours (+12 ft) high slack. Channel is marked: keep green to starboard, red to port. This is a shortcut requiring superb navigation and piloting. Visit A-Frame cabin on shore. This is an excellent spot to view wild ducks, geese, mink, marten, wolves and black bear. Low tide tonight is still +5 feet. Consider stern-tie to shore and side-tie boats. Baidarka Anchorage to Dry Pass in El Capitan Passage - 42 nm: Anchor. Leave at 0500 hours high slack to finish last 12 miles of Keku Strait. Continue on to the El Capitan Passage entrance. Temporary anchor in Entrance Cove for lunch. Leave after 1300 hours on rising tide for Dry Pass Anchorage just 2 miles further. Launch dinghy for 3-mile ride to explore 600 feet long El Capitan Cave. Dry Pass to Craig - 56 nm: Slip. Leave at 0700 hours for high tide of +7 feet and falling. Full services and provisioning in Craig. Check out www.craigak.com . Craig to Charlie Cove - 58 nm: Anchor. This cove named after Charlie E. Wood, Charlie's Charts founder. Charlie Cove to Ketchikan via Dixon Entrance - 62 nm: Slip. Leave Charlie Cove at 0400 to get +2 kt favorable tide around Point Chacon. Slack at 0800. Leave boats in Ketchikan Marina for six days. Ketchikan: Fly into Ketchikan in AM. Provision boats; fill fuel; meet next leg crew. Ketchikan to Port Tongrass - 50 nm: Anchor. Foggy Bay is the rough weather alternative anchorage. Locate anchorage just out of current. Go ashore on Tongrass Island for remnants of Indian village and Fort Tongrass. Port Tongrass to Prince Rupert, then Welcome Harbor - 37 (+25) nm: Clear Canadian Customs. Continue on to Welcome Harbor, Porcher Island, and a crabber's paradise. Welcome Harbor to Queen Charlotte City - 72 nm: Slip. Check 4AM weather at North Hecate Strait Buoy. If good leave at 0500 hours on a +12 ft rising tide with peak of 16 ft at 0730 hours. Wiggle our way out of Welcome Harbor into a 1-knot current push on our starboard beam until about 0900 hours when it's reversed. Queen Charlotte City: Spare weather or relaxing day. Take the Gwaii Haanas orientation seminar. Queen Charlotte City: Spare weather or relaxing day. Rent a car and tour the Northern Island. Queen Charlotte City to Thurston Harbor - 53 nm: Anchor or moor. Leave at 0700 hours on a 8 ft tide rising to 16 ft at 1100 hours for plenty of depth. Thurston Harbor to Crescent Inlet - 13 nm: Anchor or pick up mooring if free. Enter Gwaii Haanas National Park off Porter Head but leave Park upon entry into Crescent Inlet. Although we passed through it, we are not anchored in the Park. Crescent Inlet to Haskell Bay - 14 nm: Anchor. Enter GW NATIONAL PARK today. Stop in Hoya Passage for fresh water fill up if needed. Haskell Bay to Hot Springs Cove - 8 nm: Anchor or moor in Ramsey Passage Cove. Launch dinghy to Hot Springs 1.5 nm to the NW. NOTE: Seagate continues cruising in Gwaii Haanas. Wild Blue starts back tomorrow to Queen Charlotte City for crew exchange and contact with Hugh McIntyre aboard Lady Anne. All three boats will rendezvous at Rose Harbor on Tue, July 22 to wait for good weather to cross Hecate Strait. 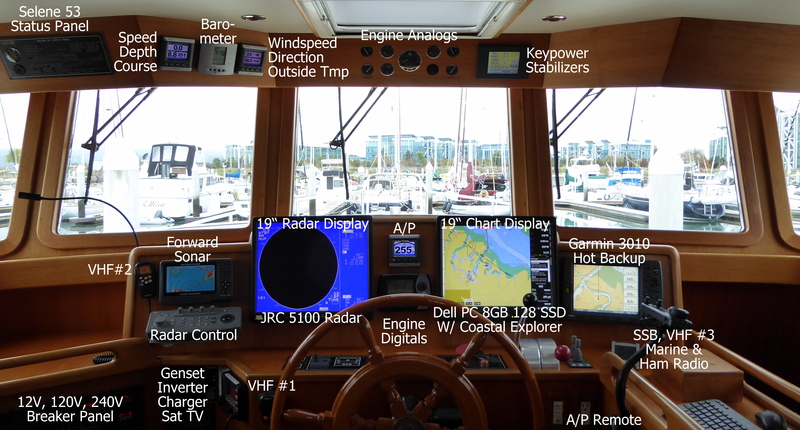 Hot Springs Cove to Thurston Harbor - 31 nm: Anchor. Stop in Hoya Passage for fresh water fill up if needed. We have exited GW NATIONAL PARK. We spent a total of 3 days in the Park. Thurston Harbor to Queen Charlotte City - 53 nm: Slip. High tide +18 at 1546. Low tide +4 at 0920. Queen Charlotte City. Crew exchange via www.aircanada.com from Sandspit Airport, Moresby Island to Vancouver. Rendezvous with Hugh McIntyre on Lady Anne. Queen Charlotte City to Anna Inlet: 58 nm: Anchor or Moor. Leave at 0600 hours for tide to cross entrance bar. Enter GW NATIONAL PARK today. High tide +19 at 1648. Low tide +3 at 1021. Anna Inlet to Hot Springs Cove - 22 nm: Anchor. Stop in Hoya Passage for fresh water fill up if needed. Anchor or moor in Ramsey Passage Cove. Launch dinghy to Hot Springs 1.5 nm to the NW. Hot Springs Bay to Ikeda Harbor - 14 nm: Anchor. Ikeda Cove to Rose Harbor - 15 nm: Anchor or moor if open. OK to side tie. Rose Harbor was an active whaling station up to 1950. Guided tours available via local residents. Seagate rendezvous with Wild Blue and Lady Anne here. Rose Harbor spare weather day. OK to leave for BC Coast if weather good! Leave GW NATIONAL PARK today. We spent a total of 5 days in the Park. There is good fresh water in Louscoone Inlet 10 nm NW of here. Rose Harbor to Dyer Cove, St. John Harbor - 98 nm: Anchor. Listen to 4AM weather at South Hecate Strait Buoy. If good, go at 0500 hours. This is an 11-hour crossing. Maybe dinner at the fishing lodge? Dyer Cove to Bella Bella: 19 nm: Slip. Provisions fuel and water if needed. Spare weather day. Crew exchange here via www.Pacific-Coastal.com at Bella Bella airport. Bella Bella to Dawson's Landing, Rivers Inlet via Darby Passage - 56 nm: Slip. Spare weather/fishing day. Head across Rivers Inlet to upscale Duncanby about 12 nm. Dawson's Landing (or Duncanby) to Port Hardy - 62 (or 50) nm: Slip. Fill water tanks, provision, and fuel up here. Check out the Natural History museum here. Visit Fort Rupert for traditional native art. Port Hardy to Cutter Cove, Chatham Channel - 48 nm: Anchor. Cutter Cove to Blind Channel Resort - 44 nm: Slip. There is a good German restaurant and fresh baked bread here. Blind Channel Resort to Campbell River (30 nm) or Comox (63 nm): Slip. Campbell River to Silva Bay - 74 nm: Slip. Silva Bay to Anacortes - 78 nm: Slip.